Join us for a fascinating tour of the area of Westminster in London. Stroll around Westminster, visit the Churchill War Rooms and experience the original bunker exactly as it was left in 1945 and explore Churchills War Museum. Your guided walking tour begins in the streets of Westminster. Here you'll see iconic London sites such as 10 Downing Street, Whitehall, the Houses of Parliament, Big Ben and Westminster Abbey. Learn about life in London during the Blitz, the evacuation of the children to the countryside, food rationing, and living with bombing raids which devastated large parts of the city. Hear about how the government moved underground to be able to continue working, and how Winston Churchill would sometimes stand on the rooftops in Whitehall at night watching the bombs rain down on London. Next, it’s time to head underground, down the steps to the wartime bunker of the Churchill War Rooms, where you’ll enjoy an audio-guided visit of the Churchill Museum. The bunker is a unique piece of living history, an underground maze of rooms that once buzzed with secrets. Learn the true stories about what life was like for those who worked in these dark rooms during the tense days and nights of the Second World War. At the Churchill Museum, you'll discover fascinating details and stories about Churchill's incredible life and legacy, and hear real audio of his inspiring wartime speeches. Using the museum’s rich interactive exhibits you can learn about Churchill’s private and public life. Your tour ends with the a visit to the rest of the war rooms, preserved exactly as they were left the day the lights were switched off in 1945. Wander for as long as you like before making your way out in your own time. The tour starts Westminster station on Victoria Embankment. Please be there 15 minutes before your tour starts. 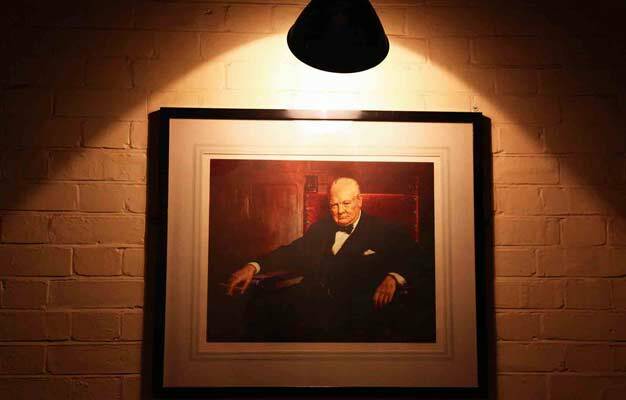 The tour ends at Churchill's War Rooms, where you are free to wander for as long as you like. The tour lasts approx. 2.5 hours. Yes, children's tickets are available for children between age 4-14. Children under age 4 are free when accompanied by a paying adult. The tour departs Monday, Wednesday & Sunday at 2 PM.